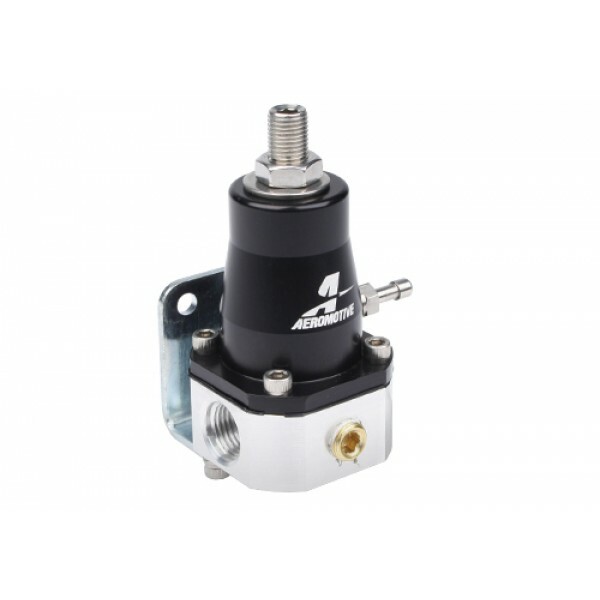 This EFI Bypass Regulator encompasses features and benefits only found on Aeromotive regulators and in a new smaller and lighter package. Capable of supporting applications up to 1000 HP, the 13129 EFI Bypass Regulator can handle high-flow EFI fuel pumps and the most aggressive street machines; especially those looking for a cleaner, lighter solution where performance is critical or where space is a premium. • Base pressure adjustable from 30-70 psi • Fuel pressure rises on a 1:1 ratio with boost • Provides (2) ORB-06 inlet/outet ports and (1) ORB-06 return port • 1/8'' NPT gauge port • Vacuum boost port (for vehicles using boost) • CNC-Machined 6061 T6 billet aluminum construction • Stainless steel mounting bracket This EFI Bypass Regulator encompasses features and benefits only found on Aeromotive regulators and in a new smaller and lighter package. Capable of supporting applications up to 1000 HP, the 13129 EFI Bypass Regulator can handle high-flow EFI fuel pumps and the most aggressive street machines; especially those looking for a cleaner, lighter solution where performance is critical or where space is a premium.